Like a baby bird nesting in the cup of my hand, a newborn fawn in the moss-cloaked trees. The shadow of a buttercup, the sigh of a moth, that’s how tender my love is. 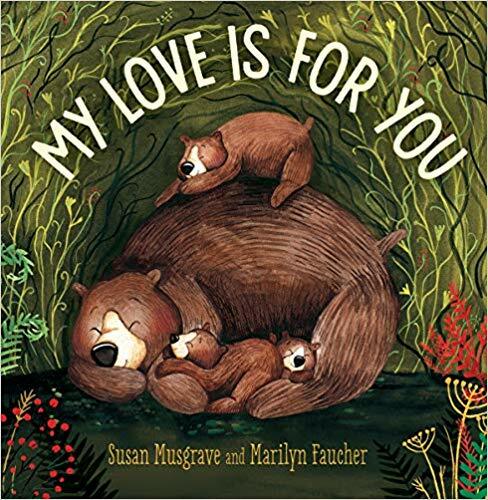 Susan Musgrave has done it again with My Love is for You, a beautifully orchestrated work of children’s poetry. This selection magically follows the flow of the seasons. Love is creatively explained using sweet similes throughout the text. At first, I was surprised that the text did not follow a rhyming pattern, but the whimsical nature of this poem is well-suited to free-verse. Luscious use of onomatopoeia floats across the page via combinations such as, “bizz-buzz-whizz” as the reader is introduced to honey bees and “crack-boom-bam” for the sound of summertime thunderstorms. Its sensitive touch seems to introduce the reader to the wonders of nature for the very first time, perfect for babies just experiencing the world. From the blossoms in the spring to snowy mountaintops, the reverence of nature and pure love is knit together flawlessly. The phrases seem to melt off the reader’s tongue, providing a soothing read aloud for infants, toddlers and, perhaps on special occasions, even adult loved ones. Using watercolour, gouache and “lots of love”, Marilyn Faucher achieves a breathtaking elegance in her illustrations perfectly complementing Susan’s literary work. Marilyn’s wispy strokes cause the fawn to leap across the page and the bear cubs to cuddle even closer to their mama. The miracles of nature are painted in a way that seems as if the scenes are from a storybook set in a far away, magical place, but, in reality, they could be in your backyard. Each image seems to caress the deepest sense of emotion love can bring depicted through ordinary changes in seasons. My Love is for You is sure to be loved and cherished in home libraries for years to come. Johanna Beaumont, a kindergarten teacher by profession and at heart, is currently away from the classroom taking care of her first newborn. She lives in Kenora, Ontario, but she’s also studying for a Masters of Special Education via correspondence at UNBC.